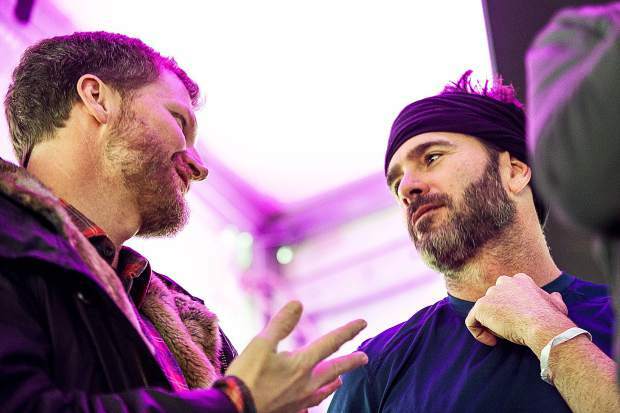 American race car driver Dale Earnhardt Jr. left, and fellow racer Jimmie Johnson, chat at the Aspen Valley Ski and Snowboard Club annual Ajax Cup fundraiser held at Shlomo's on Saturday after the racing. Dale Earnhardt Jr.’s Southern accent might stick out a bit in Aspen, but otherwise he should fit right in. The recently retired stock car driver already has a liking for the J-Bar in Hotel Jerome and felt right at home inside Zane’s Tavern, a hot spot for locals. As for the skiing, the North Carolina-native will be straight-lining the Highland Bowl in no time. Johnson, a part-time Aspen resident, played tour guide of sorts for Earnhardt Jr. this weekend, including bringing him along to Saturday’s eighth annual Audi Ajax Cup, a fundraiser for the Aspen Valley Ski and Snowboard Club. The duo even came together to auction off a NASCAR day with the two of them, with the proceeds benefiting the AVSC. While Johnson knows his way around skis quite well, this was a first for Earnhardt Jr.
Earnhardt Jr. is in Aspen with his wife, Amy, in celebration of their one-year anniversary. 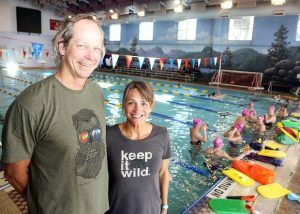 He said the first real trip the couple took together was 10 years ago to Aspen and with Johnson’s help decided to make a nostalgic trip back to the Roaring Fork Valley. 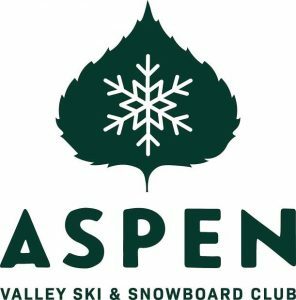 With Earnhardt Jr. sticking to the sidelines, Johnson competed in Saturday’s Ajax Cup, which was a 16-team parallel slalom competition at the base of Aspen Mountain, featuring numerous ski professionals like two-time overall World Cup champion Bode Miller and Aspen’s own Wiley Maple. While Johnson’s team, M.A.G.S. — Middle Aged Guys on Skis — took second to Team Super-G!, the real highlight for him was watching his 7-year-old daughter, Evie, compete for the first time. 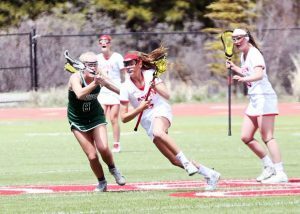 Evie isn’t quite the aggressor as her younger sister, 4-year-old Lydia, which is why her willingness to take the course surprised him. Johnson, who spent most of last winter in Aspen, won’t be around quite as much this season as he wants “to keep my eye on the prize at work for a few more years.” The seven-time NASCAR champion — a record he shares with only Richard Petty and Dale Earnhardt Sr. — is coming off a “frustrating” season after winning a championship in 2016. He’s optimistic he’ll get to No. 8 and pass “The King” and Junior’s dad on the all-time list. This doesn’t mean his Aspen days are over, just maybe more limited until he can catch up to history. Earnhardt Jr., on the other hand, is still trying to figure things out. The winner of NASCAR’s “Most Popular Driver Award” the past 15 years, he’ll spend most of 2018 in the broadcast booth after officially retiring following the 2017 season. 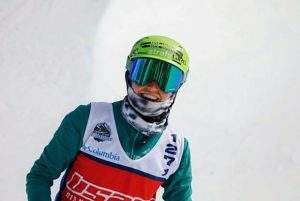 His wife is pregnant with their first child, a girl, and the extra free time he now has could mean more trips to Aspen to further his burgeoning ski career. 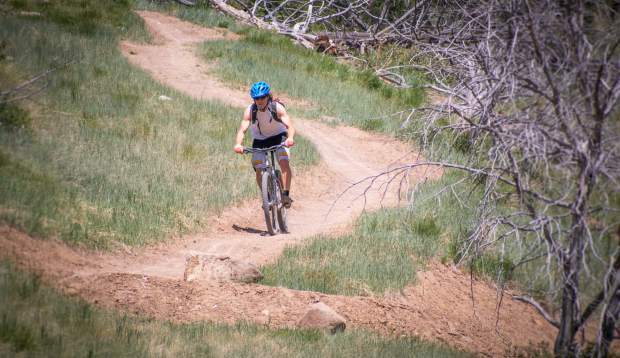 If not skiing, he said Johnson, an avid cyclist, also has gotten him hooked on Aspen’s favorite summer pastime.